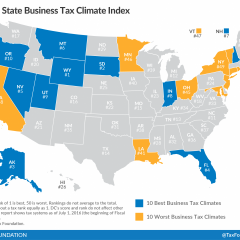 Home » What’s News » 50-State Tax Maps » How High are Corporate Tax Rates in Your State? 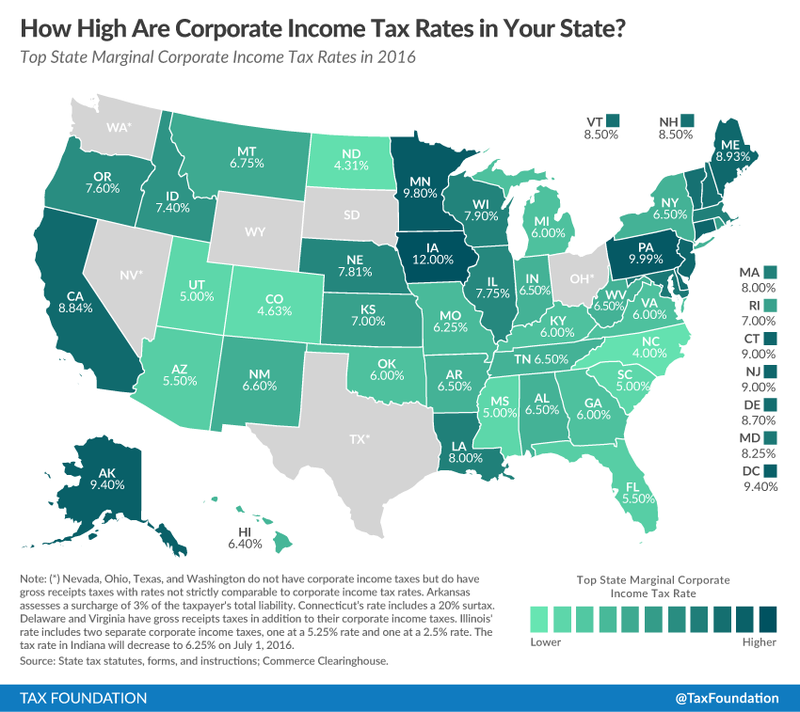 How High are Corporate Tax Rates in Your State? “State & Local Government Finance, Fiscal Year 2013.” U.S. Census Bureau.http://www.census.gov/govs/local/. See Mikesell, John, “Gross Receipts Taxes in State Government Finances: A Review of Their History and Performance,” Tax Foundation, January 2007,http://taxfoundation.org/article/gross-receipts-taxes-state-government-finances-review-their-history-and-performance; Drenkard, Scott, “The Texas Margin Tax: A Failed Experiment,” Tax Foundation, January 14, 2015, http://taxfoundation.org/article/texas-margin-tax-failed-experiment; “Broad-Based Gross Receipts Taxes: A Worthwhile Alternative?” Institute on Taxation and Economic Policy,http://www.itep.org/pdf/pb40grt.pdf. Malm, Liz. “North Carolina House, Senate, and Governor Announce Tax Agreement.” Tax Foundation. July 15, 2013. http://taxfoundation.org/blog/north-carolina-house-senate-and-governor-announce-tax-agreement. Drenkard, Scott. “Indiana’s 2014 Tax Package Continues State’s Pattern of Year-Over-Year Improvements.” Tax Foundation. April 7, 2014.http://taxfoundation.org/article/indiana-s-2014-tax-package-continues-state-s-pattern-year-over-year-improvements. Walczak, Jared. “Nevada Approves New Tax on Business Gross Receipts.” Tax Foundation. June 8, 2015. http://taxfoundation.org/article/nevada-approves-new-tax-business-gross-receipts. Malm, Liz. “New Mexico’s Lawmakers Compromise to Pass Corporate Tax Cut Reduction Package.” Tax Foundation. March 20, 2013.http://taxfoundation.org/blog/new-mexico%E2%80%99s-lawmakers-compromise-pass-corporate-tax-cut-reduction-package. Henchman, Joseph. “New York Corporate Tax Overhaul Broadens Bases, Lowers Rates, and Reduces Complexity.” Tax Foundation. April 14, 2014.http://taxfoundation.org/article/new-york-corporate-tax-overhaul-broadens-bases-lowers-rates-and-reduces-complexity.